Long before Peter joined our team he was a friend of the family and also a long time customer. He graduated from WPI with a degree in Mechanical Engineering and also has an MBA. His background is in mold design and mold building for the plastics industry. Over the years, Schwerdtle did 3D surfacing and decorative engraving for the molds that he designed. 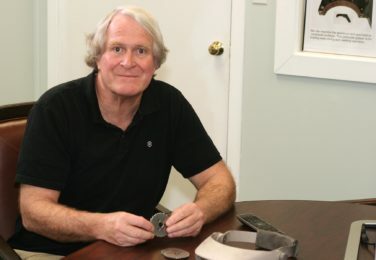 We were very happy when he decided bring his extensive experience and work with John Schwerdtle, engineering our hot stamp dies and tooling, as well as steel embossing tools, for the automotive industry and injection molds for both plastic and metal. Peter works directly with our customers to design and build custom gripper fingers for use in automation (EOAT) to hold parts during assembly and inspection. Peter is also a respected mentor and trainer to our newest apprentices as we transfer knowledge and skills to our next generation of CNC engravers and machinists.